The Most Amazing Miniature Ducati You’ve Ever Seen! - Muscle Cars Zone! 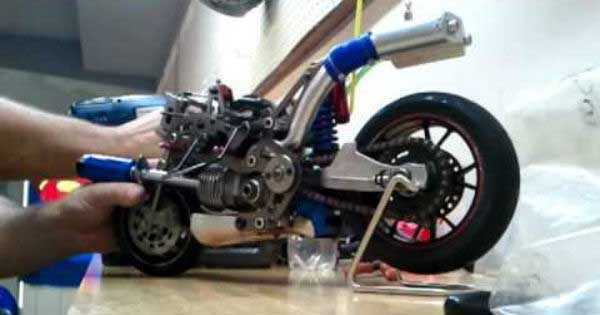 The Most Amazing Miniature Ducati You’ve Ever Seen! People are always interested in finding new stuff out and inventing something beautiful, something that is unique and unlike anything else, just like this miniature Ducati you are about to see in this video. Even though we have previously came across many different videos of people showing off their mini bikes, this one takes the game to a whole new level. The attention to details and peculiar parts of the miniature Ducati is what makes it so special. Moreover, there is one more thing that makes it so special. Namely, this is a fully functional bike. It has a tiny engine with a nitro and all of the other parts you would find in a normal size bike. It is called the Thundertiger and you would fall in love with it the same moment you see it in action. The guy powers it up using a drill and it takes just couple of attempts to get it going. Once it is up and going, the engine makes a very loud sound, sound just like you would expect a miniature Ducati to have. But, if you that that this is all the Thundertiger has to offer, you were wrong. There is one more thing that makes this one of a kind bike. The miniature Ducati is also remotely controlled. The guy takes one of those RC controllers and revs the bike up. What an amazing invention. What do you think about it, is this one of the best mini bikes that you have ever seen? However, are you looking for miniature cars perhaps? Follow this link!